According to FBI data, out of a total of 1,573,029 juvenile arrests in 2017, 5% of these were drug-related. Although we may look at this percentage and think it to be a relatively low number, this actually accounts for 79,580 arrests in that year alone. Out of all these drug-related juvenile arrests, we wondered what this looked like across the country on a state-by-state basis. To find this out, we analyzed the latest Uniform Crime Reporting data from the FBI with some interesting results. Looking at juvenile drug arrests by state, we can see that Texas has the most with a total of 9,997. This is not entirely surprising, however, because Texas is home to 7,659,600 juveniles under 18, the second-largest population of that demographic in the country. Florida, which has the third-largest population of juveniles under the age of 18, comes in second for the most juvenile drug arrests with 5,497. The state with the lowest amount of arrests is Vermont with just 49 juvenile drug arrests out of a total juvenile population of 119,800. To really drill down into juvenile drug arrests, we decided to look into the number of arrests per 10,000 of each state’s juvenile population to get a more fair representation between the states. 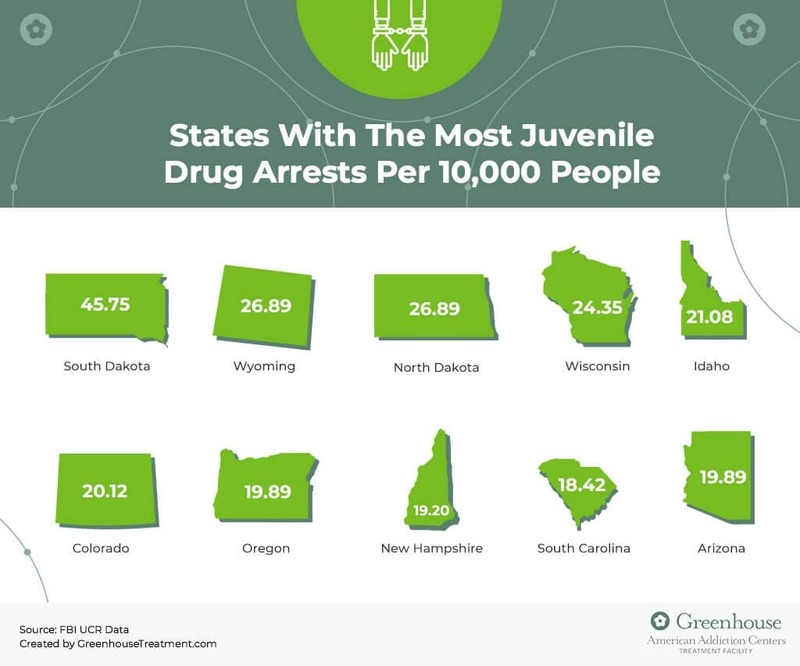 When we look at juvenile drug arrests per 10,000 people, South Dakota is the state with the highest amount of drug-related juvenile arrests with 45.72 arrests per 10,000 people. Wyoming and North Dakota follow closely behind at numbers two and three for the highest amount of arrests with 35.18 and 26.89 arrests per 10,000 people, respectively. 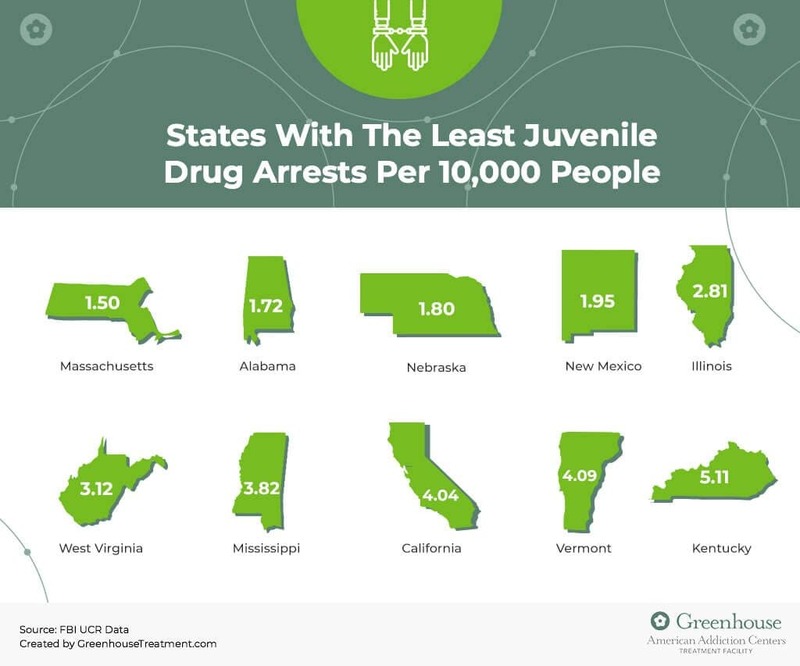 Looking at states with the least juvenile drug arrests per 10,000 people, Massachusetts has the lowest amount in the country with only 1.50 arrests per 10,000 people. Alabama comes in second with 1.72 arrests per 10,000 people, and Nebraska in third with 1.80 arrests per 10,000 people. 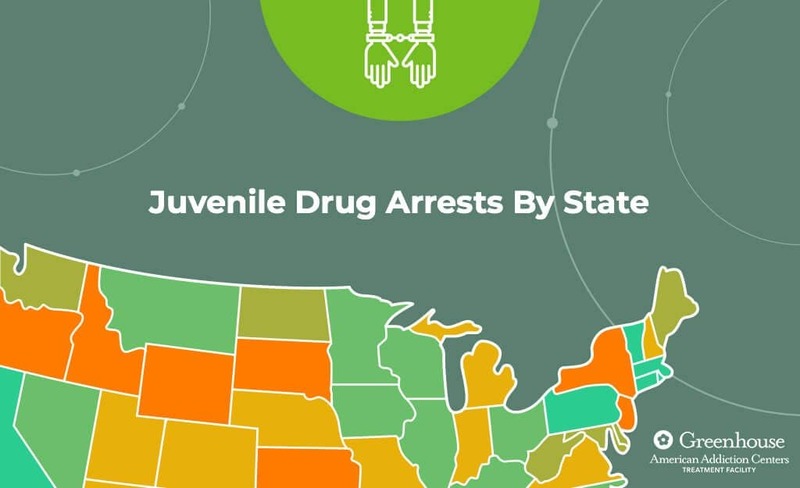 If we break down juvenile drug arrests as a percentage of all juvenile arrests within each state, New Jersey has the most with 9.89% of all juvenile arrests being drug-related. Oregon and Kansas follow closely with 8.94% and 8% of their juvenile arrests being drug-related. Massachusetts, on the other hand, has the lowest percentage of juvenile drug-related arrests in the country with just 1.39% of all juvenile arrests being drug-related. It is clear that illegal drug use is a major problem throughout the country in both juveniles and adults and the effects of these drugs negatively impact millions of lives every single day. Just like many other chronic diseases, drug addiction can be managed and treated successfully, allowing people to counteract the disruptive and negative effects drugs have on their brain and behavior so that they can regain control of their lives. If you know anyone in your life who is suffering from drug addiction, find out more about how you can help.